Our product range includes a wide range of mobile motor starter, fully automatic gsm wireless mobile starter, mobile starter, single phase mobile starter, cell phone motor starter and miscall mobile starter. 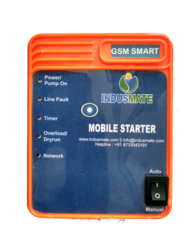 We are offering Fully Automatic GSM Wireless Mobile Starter to our most reliable customers located all-round the nation. Widely acknowledged by our customers for superior performance and longer service life, the offered product is stringently tested on industry defined parameters by our quality controllers in adherence to set international industry standards. This has Voltage Sensing technology so the motor is protected up to Stater terminals. Phase failure / loss from the supply side. 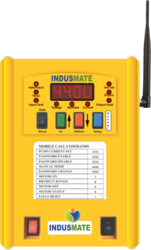 Pump current setting can be done through SMS, Mobile phone & on site. Dry run bypass facility by SMS / PHONE. Calibrated Digital Voltmeter with ± 2V Accuracy. ( Data by SMS ). Display Shows the all settable range and trips current value of set parameter online. Digital display for fault value at tripping. ( Data by SMS only). Inbuilt memory to show last setting value ( Data by SMS only ). Site settable auto start timer for power failure (3-300 secs) and SPP faults from the supply side. Site settable star delta timer (3-30 secs.). 4 Digit Password protected the operation. Auto calls disconnect facility to save call charges. Motor ON and OFF switch on the unit. • Pump current setting can be done through SMS, Mobile phone & onsite. 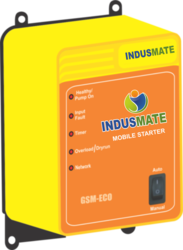 • Dial the GSM SIM card inserted in the unit and use voice interactive service. • This has VOLTAGE SENSING technology so motor is protected up to STARTER terminals. • Phase failure / loss from supply side. • Phase reversal / wrong phase sequence from supply side. This product is very unique as you can three modes to operate1. Use switches given on the unit 2. Dial the GSM SIM card inserted in the unit and use voice interactive service.3. By sending SMS to unit to do /set all the parameters. Phase failure / loss from supply side. Phase reversal / wrong phase sequence from supply side. Phase to phase voltage unbalance. Electronic overload ( site selectable). Remote sensing dry run / No load current ( site selectable). 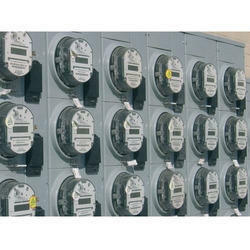 Extreme high current (EHC) or short circuit more than 24 amps. PUMP CURRENT SETTING is easy, accurate, auto setting type, with digital display.Pump current setting can be done through SMS, Mobile phone & onsite.Overload is site selectable from 20 to 50 % of set current.Dry run setting from 75 to 95 %.Dry run bypass facility by SMS / PHONE.Site selectable Auto / Manual operation switch. Calibrated Digital Voltmeter with ± 2V Accuracy. ( Data by SMS ).Calibrated Digital Ammeter ± 0.2Amp Accuracy. ( Data by SMS )Display Shows the all settable range and trip current value of set parameter online.Digital display for fault value at tripping. ( Data by SMS only).Inbuilt memory to show last setting value ( Data by SMS only )On site AUTO FAULT DETECT (AFT) for AC voltage, LEDS, Display, Relay, etc. Site settable auto start timer for power failure (3-300 secs) and SPP faults from supply side.Site settable star delta timer (3-30 secs. ).Time delay to filter power on spikes and surges. 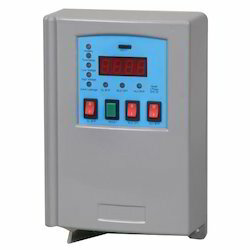 Suitable for DOL, Star-Delta Starters.4 Digit Password protected operation.Talks verbal information in required language.Works on wide voltage supply (225 to 500 V).Facility to check network communication between GSM SIM and dialer phone.No call charges when power is absent.Auto call disconnect facility to save call charges.Motor ON and OFF switch on unit.Switch for Easy bypass and network checking. Pump current setting can be done through SMS, Mobile phone & onsite. Air conditioner Fully Automatic GSM Mobile AC Starter with load indication. By offering superior-quality Energy Management Wireless Monitoring System, our firm has gained immense appreciation from our clients. Keeping client satisfaction in our mind, we use only quality assured components to develop the monitoring system. We make this available to our clients in quality packaging material at market leading prices. Daily, weekly, monthly, yearly, Quarterly, Half yearly reports generation facility. Numeric and graphical data reports. Khyatee 6000 SQ feet manufacturing set up which is certified to international quality standards ISO 9001-2000 by RWTUV Germany. certified to international quality standards ISO 9001-2000 by RWTUV. The extremely high voltage at 300 volts even in bypass mode. Low voltage with auto start. Power on spikes and surges. Electronic Extreme high current (EHC) / Overload at 26 amps. Thermal overload as per IS 8878. Short circuit protection as per IS 8878. 32 amps MCB to act as the main switch for house and protection short circuit. Technology Microcontroller based digital product with high reliability and long life. World class MCU and software which is highly faulted tolerant to noise and Electromagnetic interferences. Site selectable high voltage setting from 260 to 285 volts for site condition. Site selectable bypass facility for all protections. Site selectable bypass facility for earth leakage . Site selectable automatic function by a switch. Monitoring Calibrated Digital Voltmeter with 100 to 300 volt ± 2 volts. Accuracy. Digital display for fault ampere / voltage at tripping. Timers Time delay to filter power on spikes and surges. Additional Features Unit capacity is 25 amps ( higher amperage on request ). Totally eliminates the need for voltage stabilizers in the house. 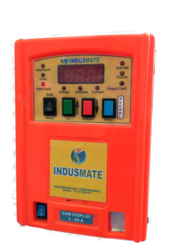 The unit is tested by government approved agency like ETDC, Govt.of India. The unit also protects from leakages in wiring and appliances so prevents wastage of electricity so indirectly may save electricity bills. We can also find out faulty appliances and wires where there are current leakage and wastage. Color coded Teflon wiring with lugs for longer life. Modular design very easy to install and site servicing. The "Khyatee GSM Water Motor Mangement" is intelligent and flexible motor management system. It offers comprehensive motor management including extensive protection, monitoring and control functions. With easy to use operation and on-site diagnostic data helps us to carry out predictive maintenance and GSM Technology based operations. This product is very unique as you can three modes to operate . 3. By sending SMS to the unit to do /set all the parameters. Katee M4 DISPLAY SIM uses activated SIM card from any GSM service provider which communicate with the server or any mobile phone. For example, the system is installed and connected to the motor than it continuously monitors/ protects every activity of motor at the site and sends all data to the webserver / website or any mobile phone by SMS on real time basis. Extreme high voltage at 300 volts even in bypass mode. 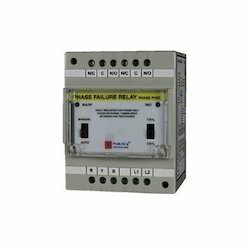 32 amps MCB to act as main switch for house and protection short circuit. World class MCU and software which is highly fault tolerant to noise and Electro magnetic interferences. Site selectable automatic function by switch. Monitoring Calibrated Digital Voltmeter with 100 to 300 volt ± 2 volt. Accuracy. On site Auto Fault Detect(AFT) for AC voltage, LEDs, Display, Relay, etc. Unit is tested by government approved agency like ETDC, Govt.of India. Unit also protects form leakages in wiring and appliances so prevents wastage of electricity so indirectly may save electricity bills. We can also find out faulty appliances and wires where there is current leakage and wastage. Color coded Teflon wiring with lugs for longer life. Modular design very easy to install and site servicing.